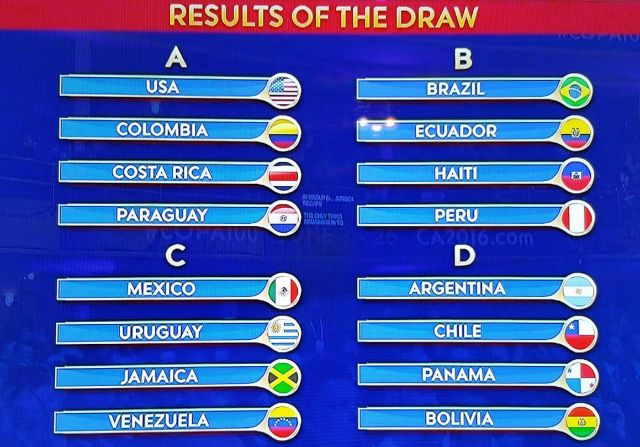 Copa america 2016 groups and teams full information with graphics. The tournament will open on Friday, June 3, when host United States welcomes Colombia to Levi’s Stadium in Santa Clara, California, in Group A action. Costa Rica and Paraguay round out the highly competitive Group A. Other notable group matches include a rematch of the 2015 Copa America final between Argentina and Chile in Group D on June 6 and a second continental finals rematch when Jamaica and Mexico clash on June 9 in a replay of the 2015 CONCACAF Gold Cup final. The Copa America Centenario honors 100 years of the Copa America tournament and will feature some of the world’s best teams and players. The tournament will feature the top star players from North, South and Central America, including Messi, Neymar, Javier “Chicharito” Hernandez, David Luiz, James Rodriguez, Kaka, Michael Bradley, Clint Dempsey and many more. The final will be played at MetLife Stadium in East Rutherford, N.J., on June 26. You can use hashtag #CopaAmerica2016groups share and submit on network social. Thanks!